A full moon rises over Carrowkeel. In the foreground is Cairn C, the Leperachaun's House. Beyond are Cairns G and H on the main ridge of Carrowkeel. In general interest the Bronze Age cemetery of Carrowkeel is equalled only by the more famous ones of Brugh-na-Boinne and Lough Crew. None of its sepulacral chambers approaches the regal proportions of New Grange, and the rock-scribings that form so remarkable a feature of both the great Meath monuments are entirely absent at Carrowkeel. 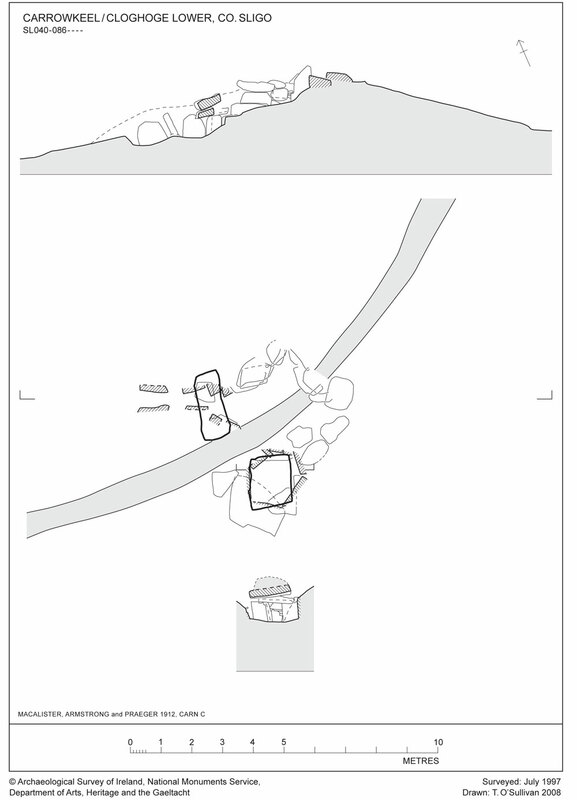 On the other hand, the Carrowkeel group displays a greater variety of design: but the main interest of its exploration lay in the fact that there was no evidence that its cairns had been opened and ransacked long since, as in the other places: most of them appeared to be intact, even when ruined, and they gave an important insight into the burial customs of the Bronze Age people. Assuming that the apparent absence of any disturbance means that at no time subsequent to the period of interment have these chambers been robbed, their contents seem to explode the popular idea that at least the more elaborate of the Irish cairns contained along with human remains, golden torcs or lunulae, or other contemporary treasure belonging to those who were buried in these imposing mausoleums. The monuments are grand, and there may have been elaborate funeral rites, but a few trinkets alone seem to have accompanied the sepulture. Cairn C is located on the northern end of the spur called Cairn Mor, on the east side of the Bricklieve Gap. Although it is in a ruinous state the cairn is visible from a long way off. A field wall has been built across the top of the monument, using stones from the cairn. It is quite a large cairn with a diameter of about 22 meters and, whilst the chamber has collapsed and filled with rubble, it obviously has a large cruciform chamber. Looking west at Cairn C, The Leprechaun's House. Judging from the passage and remaining lintel, Cairn C is oriented across the destroyed cairn at Cairnaweelen on the north east spur of Keshcorran to the sites on Knocknashee. This means that the sun will shine into Cairn C as it sets over the Ox Mountains, possibly in early May and August; and that at certain times in its cycle the full moon will also illuminate the interior. There are many fragments of quartz remaining around the entrance to the cairn. This type of alignment is a common feature of Irish cairns: where the passage of one monument is often oriented to another prominent cairn, as well as the chosen rising or setting position of the sun and moon. 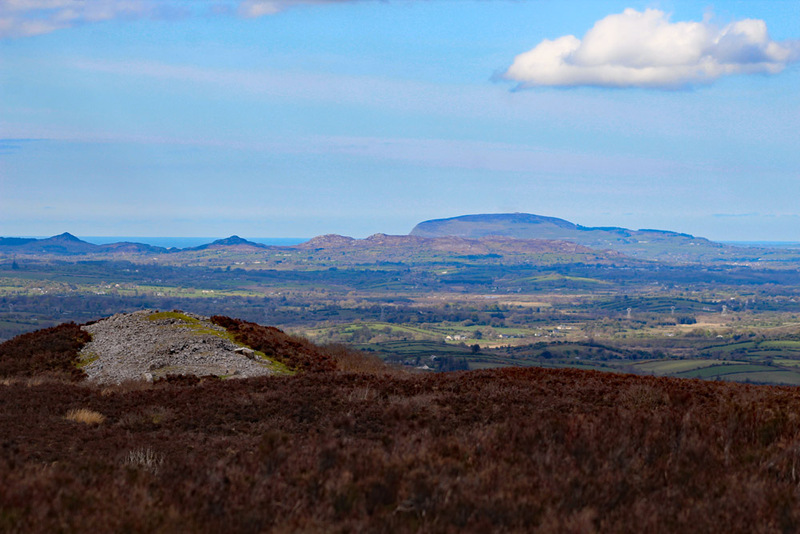 This occurs at several of the other Carrowkeel cairns: Cairn B opens to Knocknarea; ruined Cairn M is oriented to Kesh Cairn; Cairn G opens on to a window of horizon stretching from Doomore and Croghan in the Ox Mountains to Queen Maeve's Cairn; and Cairns E and K are both aligned to the most important monument in the region, Queen Maeve's Cairn on Knocknarea. 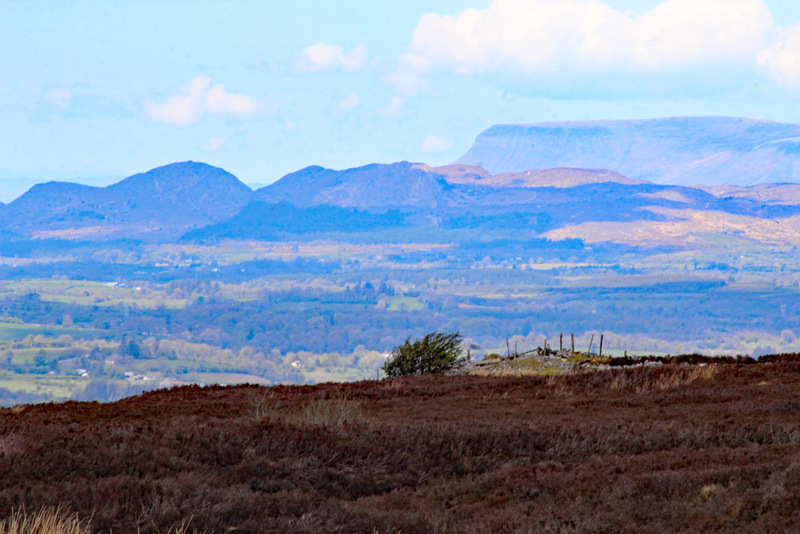 Cairn C was known locally by the old people during Macalister's time as the Leprechaun's House and, apart from F which was known as Cairn Mor is the only structure with a name of any kind. Cairn C: This structure is much ruined, having evidently been despoiled of stones to provide material for the field-fence that runs alongside of it. The chamber has apparently been wilfully destroyed, and the large stones of secondary interments, perhaps long subsequent which it was composed are thrown about in confusion. It appears, however, to have been of the cruciform type, of which G and K, described below, are the most conspicuous examples now surviving in the group. But it is so injured that it is impossible to be certain about its original form. The Ordnance map, which omits nearly all the more conspicuous carns of the series, has recorded	this comparatively	insignificant	example. This carn has the distinction of being, so far as we could learn, the only structure of the group which has a distinctive name. This is English, "The Leprechaun's	house." The	name seems	to indicate that it stood open, and fairly complete, so suggesting the idea of a house, till it was wrecked by the fence-builders. Cairn B, Cairn E and Kesh Corran. Cairn D is immediately beside Cairn C to the south and is in a ruinous state; indeed, it has almost been reclaimed by the bog. There is little left of passage or chamber, with cairn stones strewn and scattered about and chamber and passage stones displaced or missing. One can only guess at the alignment or type of chamber, such is the confusion of the remaining stones. Macalister thought it may have contained an undifferentiated chamber like Cairn B & H. Judging by the jumbled remains this also was a large cairn. Cairn D: This carn is about 50 feet to the south of C. It is ruined to its foundations. There are traces of a kerb of large stones, standing on end, and of a passage in the south-east face, running in a north-westerly	direction into the carn, and ending in a cist. The carn, accordingly, seems to have affinities with H; but, being so ruined, satisfactory measurements cannot be taken, nor can it be planned with certainty. Looking west across Cairn C, the Leprachaun's House. Cairn B, across the valley, is visible to the left.